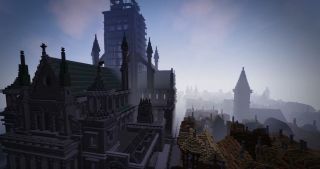 The Museum of London uses Minecraft to rediscover the Great Fire of 1666. Videogames are no stranger to classrooms, however few games have made such an impact as Minecraft. There's the qCraft mod that teaches players quantum physics, and the time Denmark was recreated to scale (before being subsequently levelled), and don't forget MinecraftEdu and its official Microsoft-bought successor Minecraft: Education Edition. Map one, launching next week, features London Bridge, Pudding Lane, and the old Saint Paul’s Cathedral. A treasure hunt is designed to encourage exploration and will also give players the chance to uncover audio clips relevant to the events that led to the blaze. To mark the disaster’s 350th anniversary, the second phase will arrive in September and will guide players through the start and spread of the Great Fire; while the third and final instalment is due to launch in February of next year—which is when players can set about rebuilding their own visions of the city. Grab the first Great Fire 1666 Minecraft map when it becomes available next week, July 29, via the Museum of London website.